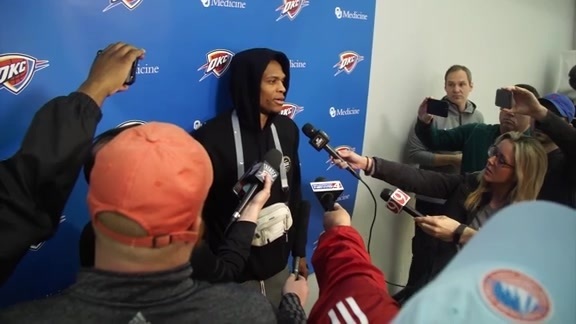 With three days in between games against Western Conference playoff foes, the Thunder has had plenty of time to heal up, study up and on Tuesday sweat out the past and look ahead to the final 7 games of the regular season. At 44-31, the Thunder is currently slated in 4th place in the Western Conference, with home court advantage in the first round of the postseason if that were to hold. Yet coming up over the next six games are a sextet of above-.500 squads, many of whom are battling for playoff seeding. The Thunder needs the wins in order to maintain its positioning, but Head Coach Billy Donovan also knows that his team must approach this stretch with the same commitment to team principles on offense and defense as it has all season. Being deliberate and focused on the right things is much more vital this time of year than over-dramatizing a single game or stretch of contests. “As a coach what you want to be able to do, is you want the message the first day to be the same as the 75th game in terms of what we’re striving for,” Donovan said. One important part of the consistency for the Thunder is to continue staying true to the fundamentals that got the players to NBA and the highest levels of competition to begin with. Both of the Thunder’s most potent wing scorers, Paul George and Carmelo Anthony, have been going through a cold streak shooting the ball as of late. They’re getting the same looks that they’ve gotten throughout the course of the season, but the ball just isn’t dropping right now. For Donovan, it’s always important to be identifying more opportunities to create high percentage looks for his players, but he also trusts that perennial All-Stars will find their groove once again. Despite poor shooting nights and the fact that they can have a mental impact, the Thunder has resolved to continue trusting one another, to play with the pass and to encourage teammates to shoot the ball with confidence when open. Relying on that brotherhood, staying mentally engaged and upbeat and powering through a dip in shot-making is often the solution. “So much of it is just keeping yourself in a good frame of mind, that the next one’s gonna go in and maintaining a level of confidence and going through your routine and understanding why you make shots and why you miss shots,” Donovan summarized. - In the last five games he’s played since missing the Thunder’s road battle in Atlanta with a hip injury, Steven Adams is averaging 19.8 points on 62.9 percent shooting, 10.2 rebounds, 1.8 assists and 1.4 blocks in 35 minutes of action per game. Adams has been a steady force for the Thunder all season, so this statistical leap only tells part of the story about his basketball IQ and ability to help the team. 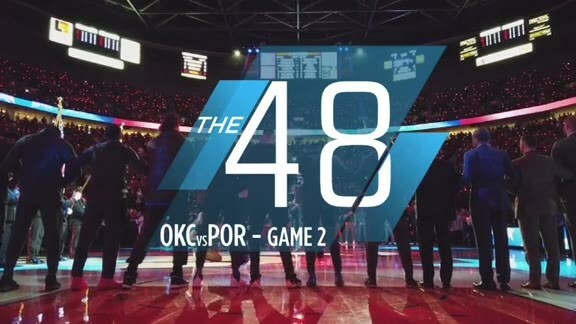 - The Thunder is not just a veteran squad, but they have a who’s who of NCAA tournament standouts. With the Final Four coming up this weekend, players and coaches reflected on playing in the tournament and dealing with being a part of the final quartet of teams standing. This season, Nick Collison’s Kansas Jayhawks are the only of the Thunder players’ alma maters that made it to the Final Four. The 17 players on the Thunder roster, which includes their two two-way guys in PJ Dozier and Daniel Hamilton, have 28 NCAA tournament appearances, 18 Sweet 16’s, 14 Elite 8’s, 13 Final Fours and 5 National Championships. Head Coach Billy Donovan himself had 14 tournament appearances, 8 Sweet 16’s, 7 Elite 8’s, 4 Final Four’s and 2 National Championships. On Tuesday Donovan shared some wisdom about playing in the Final Four and going up against an 11-seed, like this year’s Loyola-Chicago squad.